A FREE Doctor Who comic, *Sub Zero, featuring the Third Doctor and the Daleks, originally presented in 1972! A chat with Doctor Who’s masterful writer, genius script editor, prolific novelist and creator of the Time Lords. DOCTOR WHO IN THE 1970s! An exploration of how Doctor Who reflected the real world during the 1970s. We vworp back to revisit what was happening during a single month in Doctor Who history: November 1977. Part One of a brand-new comic strip adventure, set in 1973, written by Mark Wright and illustrated by Staz Johnson. 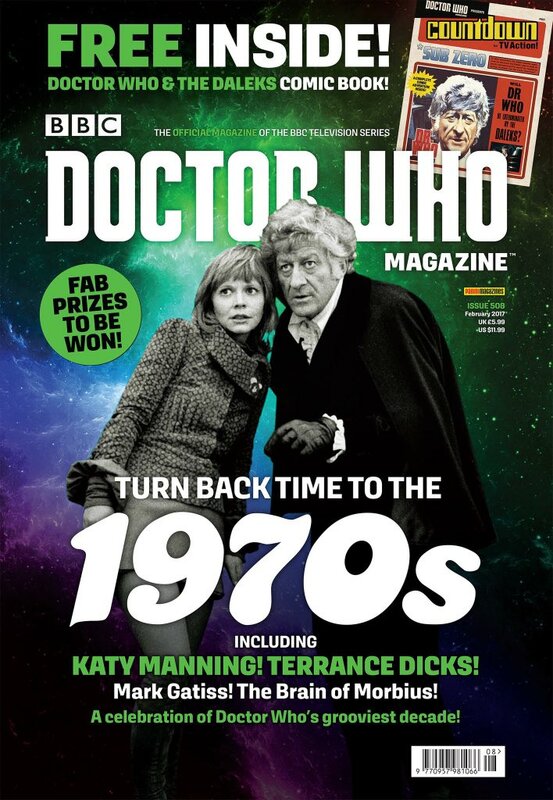 1970s Doctor Who meets Gothic horror, as the TARDIS lands on Karn in this issue’s Fact of Fiction. A look back of the 2016 Christmas Special The Return of Doctor Mysterio, plus all the latest audio releases. A look ahead to all the latest Doctor Who CD and book releases, coming soon. AND! All the latest official news, competitions, and answers to The Watcher’s Christmas Quiz.